By Lynn Taylor, author of "Tame Your Terrible Office Tyrant"
(CareerBuilder.com) -- Do you ever think your boss behaves like a child going through the "terrible twos," throwing tantrums or reverting to a little lost lamb when in over his or her head? I call this regression "Terrible Office Tyrant" (TOT) behavior. TOTs can act like schoolyard bullies afraid to reveal the slightest incompetence, or like helpless children. They can be fickle, stubborn or needy or have irrational fears. And they can consume your workday, not to mention wreak havoc on productivity and profits. A bad economy, workplace pressures and stress can trigger the many striking similarities between bad bosses and terrible tykes. We're all human, and behind a boss's professional facade is often a grown kid who can't handle his or her power. When your boss slips into any of the 10 classic TOT behaviors, including the "bratty" type (overly demanding, stubborn, self-centered or tantrum-throwing) or the "little lost lamb" variety (fickle or overly fearful), you can use proven parental techniques and actually thrive in your job. By seeing the childlike motives behind a boss's (or co-worker's) actions, you can better manage even the most difficult situations. Communicate frequently, openly and honestly. Savvy TOT-tamers take the initiative to establish an open dialogue. At work, stay aligned with your boss's objectives rather than focusing on your pet projects, so that your work remains consistent with what's most critical to management. By bravely opening the dialogue, you'll also avoid misunderstandings with co-workers; other factors may be contributing to an ignored e-mail or seemingly unfriendly response, such as a tight deadline or pressure from the boss. Be alert for problems and prepared with solutions. Offer answers to emerging issues; don't add to the pile of problems if you want to avoid triggering bad behavior. Your boss wants to delegate as much as possible -- as long as you make the process worry-free. Know when to stay away if you expect a tantrum is coming down the hall. Use humor, or what I call "the great diffuser" of tension, to break down interpersonal logjams. Laughter helps create bonds and reminds us of our larger purpose: to work together with upbeat, constructive energy. We can and should be able to accomplish great things as a team at work, while having some fun. Take the initiative to do this and watch the seething subside. Let yourself shine by being a problem-solver and collaborator. You can be a beacon of positive energy for your boss, co-workers and team. Part of managing up also means setting limits to bad behavior. Oftentimes TOTs are unaware of the effect of their actions. You can influence these actions, and your skills will be transferable to any job. If your TOT is tantrum- or bully-prone, mirroring his childish behavior is a downward spiral. Avoid the temptation to win the battle and lose the war. 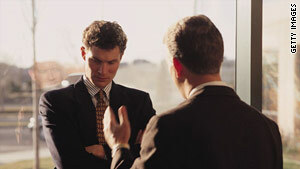 Instead, calmly and concisely tell your boss how his or her actions affected you. Keep a matter-of-fact tone and be factual. Use "I" statements rather than "you" to avoid an accusatory demeanor. When bosses set aside their worst TOT traits, respond with gratitude and comment on how it inspires you to do your best. Praising positive actions is a powerful way to foster better behavior. Over time, your boss will link the better management style with positive employee morale and results. Remember, if there's something in it for your boss, you can effect change. Timing can be everything, with a child or an office tyrant. Learn the best times of day to approach your boss. Study his or her patterns, mood swings and hot buttons and plan your interactions accordingly. It can make the difference between a pleasant "yes" and an irrevocable "no!" If you anticipate problems with solutions, you become indispensable. Project the highest ethical standards and radiate positive energy. Maintain a balanced demeanor and approach each crisis (real or imagined) with a rational style. Your boss often needs a sounding board and you can be a valued voice of reason and calm when issues emerge. Some TOTs can be frustrating when they're inattentive or unavailable. It can seem like a form of corporate ADD, or as I call it, BADD (boss attention deficit disorder). BADD bosses can't focus on important tasks and allow e-mails, text messages, phones and people to interrupt their (and your) flow. Make sure you understand your boss's ideal communication method, package your work in an appealing way and make your presentations engaging and interactive. Make it irresistible for your boss to find out about your projects. Let bosses know privately when they've gone over the line, but do so diplomatically. Keep the conversation focused on your work product. If your manager is intentionally malicious, that's another matter that requires more serious action. If, after repeated efforts for cooperation (such as with a bully boss and unsupportive management), you may be best off looking elsewhere. You have to determine how much strife you can handle. Lynn Taylor is a nationally recognized workplace expert and author of the newly released book, "Tame Your Terrible Office Tyrant (TOT): How to Manage Childish Boss Behavior and Thrive in Your Job " (John Wiley & Sons). Taylor is regular online workplace contributor to BusinessWeek and Psychology Today , and the monthly HR columnist for SmartHRmanager.com.